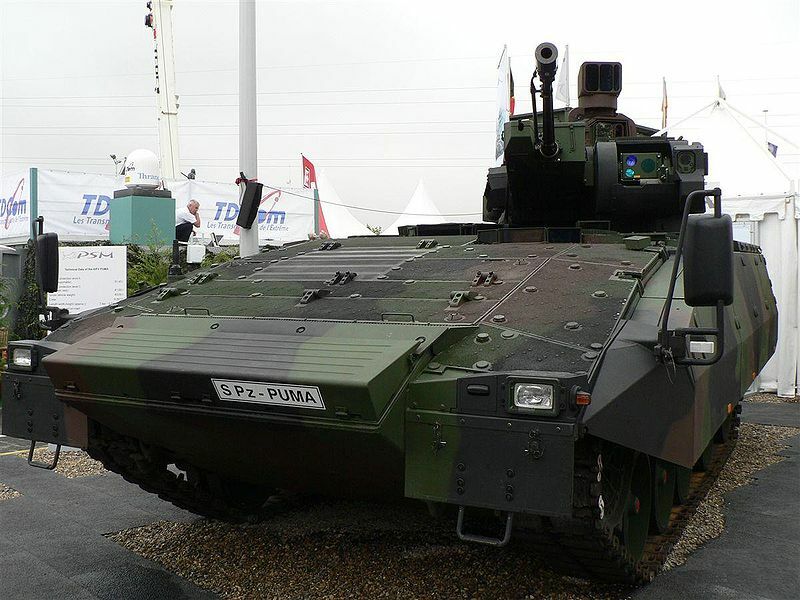 The Puma IFV (Infantry Fighting Vehicle) is a German vehicle designed to replace the aging Marder IFVs over the period 2010 to 2020. It is a tracked vehicle with 3 crew and carrying 6 infantry. It has a full tank range of around 600 km and a maximum speed of 70 km/h. Its primary armament is a 30 mm auto-cannon capable of pumping out up to 700 rounds per minute. The Puma will also carry a machine gun, the Spoke LR anti-tank guided missile launcher (on the German vehicles at least), grenade launcher and smoke-grenade launchers. There is a useful article on the Puma IFV at Wikipedia.